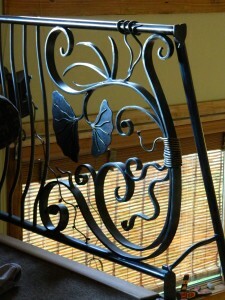 Metal artist Jerry Merz discovered his passion for metal work in 2000 after taking some classes from a local blacksmith. He improved his skills and began creating custom lighting, banisters, gates and other metal elements for homes and gardens. When business slowed down in the recession, Jerry decided to bide his time until the economy revived by launching an adventure: he left the Valley for a two-year volunteer stint in Zambia, where he ended up setting up a metal shop and teaching the locals metal working skills. Now back in Twisp, Jerry creates pieces for the community and teaches kids metal working skills. TwispWorks was a great match for him thanks to its collaborative spirit and community engagement.